This was so much fun and was over way too soon. I knew from the moment I read this weeks challenges who my pick for favorite artist would be. Now, mind you I have a whole list of inspiring artists that are out there right now, Misty Mawn of course being one of them, but for this challenge I wanted to go back further. I have loved this work of Amedeo Modiliani, ‘Portrait of a Woman in a Large Hat’ for a long time. I have often thought to replicate it as an inspiration page in my journal, but have never gotten around to it until now. I love the warm skin tones he achieved and those amazing blue eyes that aren’t really eyes at all. Graceful, long neck, and features, and the hand, I love adding a hand to my work. So representative of all women do. It seems that art is inspired by those who have gone before us and the visual images we are exposed to everyday. Look around you and be inspired. Loving the colors you used in this Pam! I saw a Modigliani exhibit this spring in Europe. The experience of being in a not-large room with many of his paintings was pretty strong, emotionally. I bought this bookhttp://www.amazon.com/Modigliani-Life-Jeffrey-Meyers/dp/0151011788It is fascinating because it explains the tragedy of his life and why’s. But especially interesting is the times in Paris when he and Picasso worked. Fun read. What a beautiful page. You’re right about the hand; it adds a further dimension to the work. Beautiful, beautiful page, Pam! You did a wonderful job…I knew the moment your blog came up who your “favorite artist” was…of course, I went on to read your post too 🙂 Great work! What a beautiful spread. I love Modigliana also. He is one of favorite artists. I loved the movie about his life. Your homage is a great success. Knew before reading who your artist was – nice job! Pam, your work is lovely and so inspiring. I signed up for your online class last week and haven’t even had a chance to get started! I need to find some time! WOW, Pam! 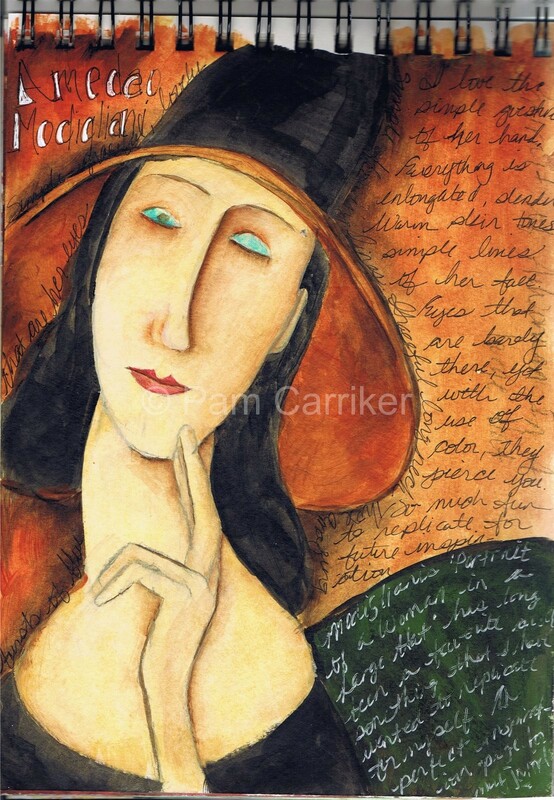 I love the work of Modigliani and especially this one!! You captured her perfectly. I wonder why he hardly ever gave them eyes?? Great work. I am enjoying your class in visual journalism although working in collage is a challenge for me.I Love your work! I love his work too. did you see the movie with andy garcia in it? i just watched it for the first time last night and it was amazing. i totally recommend it!